Chairman, members of the Subcommittee, thank you for having me testify on the topic of hydraulic fracturing, which is a critical technology for increasing domestic natural gas production. I am glad to have the opportunity to share my state’s perspective on this practice—which, I am proud to say, we helped develop, and is essential to the development of the three shale plays in my home state: the Barnett, the Haynesville, and the Eagle Ford. I’d like to focus on a few key points. First, Texas and the United States have a bountiful supply of natural gas with significant, positive implications for our economy, and our future energy security. Second, states are effectively regulating hydraulic fracturing. Third, federal regulation by the Environmental Protection Agency (EPA) would inevitably lead to duplicative regulation, bureaucratic delays, and diminish the production of this important energy resource. Over the past decade, the combination of horizontal drilling and hydraulic fracturing has allowed access to large volumes of shale gas that were previously uneconomical to produce. Production of shale gas is expected to continue to increase, and constitute 45 percent of U.S. total natural gas supply in 2035, as projected in the 2011 Annual Energy Outlook by the Energy Information Administration. In Texas, the oil and gas industry provides more than 1.7 million jobs and accounts for nearly 25 percent of the state’s economy. Over 11,000 gas wells have been completed in the Barnett Shale, one of the nation’s most active and largest unconventional natural gas fields. The Barnett Shale production currently contributes over 20 percent of total Texas natural gas production. 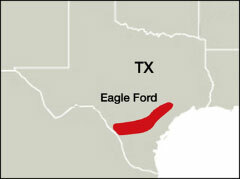 In South Texas, the Eagle Ford Shale is also booming. According to a recent study by the University of Texas at San Antonio, the long-term regional implications of the boom are staggering. According to a study by the university: "Under modest assumptions, by 2020 the Eagle Ford shale is expected to account for close to $11.6 billion in gross state product, $21.6 billion in total economic output impact and support close to 67,971 full-time jobs in the area." The Haynesville Shale in East Texas and Louisiana was not commercially viable a few years ago, but is today thanks to technology. I recently visited a new drilling rig in Nacogdoches, Texas that represents the latest improvements in horizontal drilling – using more energy efficient engines, leading to shorter drilling times and reducing the impact on surrounding areas. The proliferation of these domestic resources has contributed to Texas’ ability to add jobs in the current economy. Yet the job creators and workers on the rig were anxious about Washington’s misguided policies. Hydraulic fracturing has been used safely in tens of thousands of wells across the state. The practice has been studied by the EPA, Ground Water Protection Council (GWPC) and the Interstate Oil and Gas Compact Commission (IOGCC). In each case, hydraulic fracturing was judged to be environmentally sound. At every step in the drilling process, energy producers are subject to state regulations as well as federal requirements through the Occupational Safety and Health Administration, the Environmental Response, Compensation and Liability Act and the Toxic Substances Control Act. This week, the Ground Water Protection Council (GWPC) and the Interstate Oil and Gas Compact Commission (IOGCC), unveiled a landmark web-based national registry for the disclosure of the chemical additives used in the fracturing process. Energy companies now have a single source to publically disclose these fluids on a well-by-well basis. Though state regulators are already aware what chemicals are being used, and hydraulic fracturing has not been the culprit in water contamination, this registry is an important tool for the education of the public. However, legislation introduced by my friend, Senator Casey, known as the FRAC Act, would go beyond public disclosure of chemical additives and give the EPA direct regulatory authority over hydraulic fracturing for the first time in history. In my view, there is no need to destroy the current partnership between state and federal regulators and put the EPA in the driver’s seat. Unfortunately, we’ve seen what over-regulation and misinformation can do to our energy supplies. Additional layers of federal red tape, lawsuits, and restrictions can create “death by a thousand cuts” that run independent producers out of business – and take with them valuable jobs, as well as local, state and federal tax revenue. Without hydraulic fracturing, access to potentially massive natural gas resources in America’s shale regions would be substantially restricted. An article in BBC news today indicates that the amount of methane leaked from these shale wells is a third to twice as much as conventional wells. Given that methane is many more times worse that carbon dioxide with respect to greenhouse gas effects, this sounds like it could be a really bad idea. Unless this technology can reduce the loss of methane to less than conventional wells, this is not a good idea. I am not advocating cutting out all fossil fuel exploration for our energy needs, as we have no current way around our dependence on them, but it is embarrassing when the United States invests less on renewable energy investment than Germany. 1) If the BBC report is correct and natural gas companies are losing up to 8% volume per well, do you think the natural gas companies (in an effort to create a profit) would fix this problem themselves without government intervention to reclaim this lost revenue? 2) With the wealth of natural mineral assets at our disposal (unlike Germany) do you feel like it would be more embarrassing if we did not capitalize on this commodity that was literally right under our feet? 3) One of the largest German corporations, and one of the largest providers of the natural gas engines currently being used in the Eagle Ford, Haynesville, Marcellus, and other shale plays is Caterpillar Inc. Caterpillar has seen it's stock rise from 54.89 to 113.93 since the increase of oil and gas production, and since Germany has a corporate tax rate of 15%, I would say it's safe to say Germany is investing in our natural gas too. 4) I am not advocating depending only on fossil fuel exploration for our energy needs, however, currently we have no renewable energy resource that can supply our country with the adequate energy, so I would argue it would be embarrassing if the United States was investing less on fossil fuel exploration than Germany.